Updated: 1:40 p.m. | Posted: 6:03 a.m. 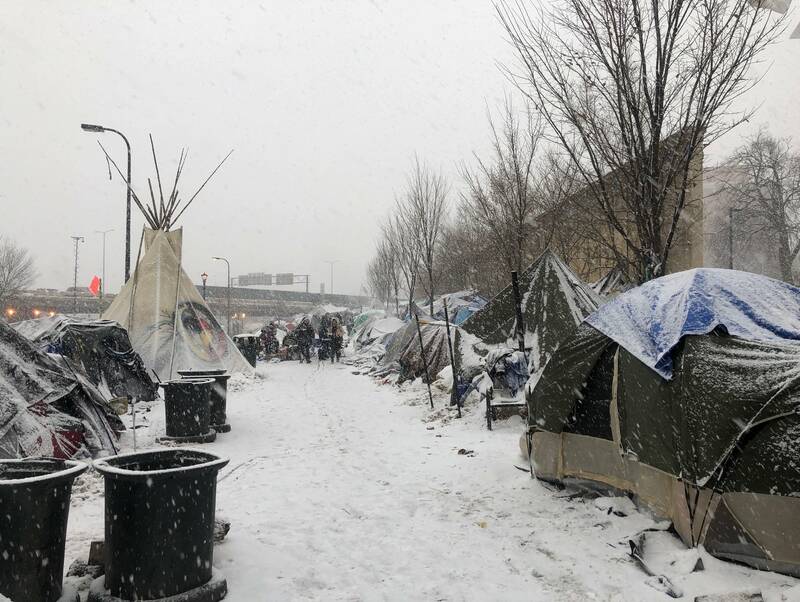 Native American leaders in the Twin Cities condemned the actions of a group working in the homeless encampment in Minneapolis in a public statement Friday. The head of the Metropolitan Urban Indian Directors (MUID) says members of Natives Against Heroin (NAH) have become too controlling and aggressive. Some outreach workers say they are afraid to enter the camp, even as they prepare residents to move to an emergency shelter, known as a navigation center, across the street next week. In the statement, MUID accused leaders of Natives Against Heroin of "actively discouraging camp residents from moving" to the navigation center. NAH leadership has intentionally disrupted efforts to provide transition information to the camp residents and has spread inaccuracies and misrepresentations about the conditions which will be at the [Navigation Center]. Those representing NAH have encouraged racial divides among the camp residents, and among those bringing support to the camp. NAH's tactics have employed violence, and threats of violence, to deter people from delivering support to those living at the camp. "Too many stories and firsthand accounts have come out of behavior that is just not OK and is disrupting the ability of the residents to get to a better place at the navigation center," said Patina Park, the executive director of the Minnesota Indian Women's Resource Center, who chairs MUID. James Cross of Natives Against Heroin, or NAH, was one of the first people to start helping the people living in tents along Franklin and Hiawatha avenues. That was back in August, when you could still see grass between tents, and they numbered in the double digits. NAH set up a tent in the middle of the encampment. A half-dozen members take turns managing the constant stream of donated clothes and tents and food coming in. They also buy hot meals with some of the tens of thousands of dollars they've raised for their work. Members also administer the drug Narcan if someone overdoses. Sometimes they do this multiple times a day. NAH also took it upon themselves to provide security for the encampment. 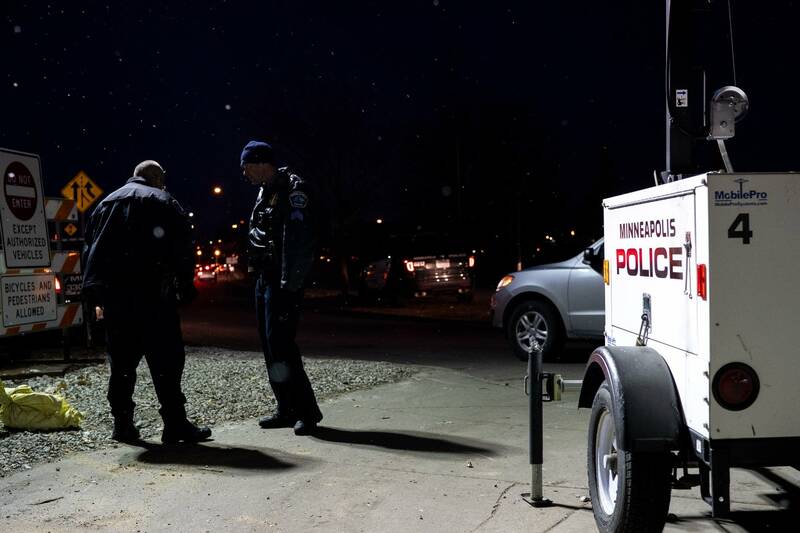 In an interview in October, Minneapolis Mayor Jacob Frey said the city wanted to be sensitive to people traditionally untrusting of police and that arrests would be focused outside the encampment on those dealing, not those using. "The arrests are specifically targeted at those who are engaged in human trafficking and or drug trafficking and we traditionally have them focused around the perimeters," said Frey. Police have not been totally absent. Frey said two beat officers were assigned to the encampment. But NAH members are a near-constant presence: they de-escalate fights and confront people they consider troublemakers. They even kicked out people they suspected of dealing heroin and livestreamed it on Facebook. While some appreciate NAH's work, other residents and outreach workers have not. NAH members sometimes brandish logs and baseball bats. The colder weather adds to the stress at the camp. A few weeks ago, a woman hit NAH member Fabian Jones in the head with a bike pedal wrapped in a sock. Police were called. Jones threatened to retaliate. He also called for more police presence, especially at night. "We want more patrol," Jones said then. "We want more presence down here. We want people safe." Cross added that they were taking a chance they could be arrested. "Ain't no one going to bail us out. We got families and children and grandchildren." 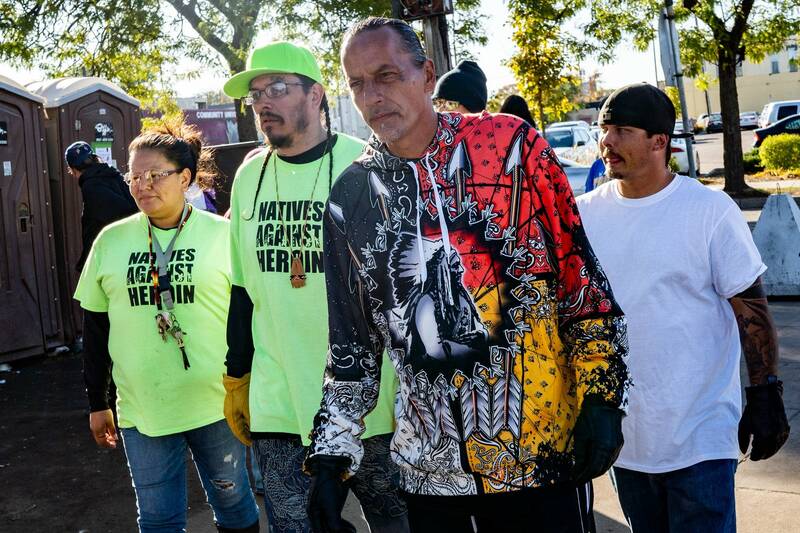 Park and a small group of Native American nonprofit leaders met with Minneapolis police Chief Medaria Arradondo last month and also asked for more law enforcement, but it's unclear if police have increased their presence. The Minneapolis Police Department has declined multiple requests for comment. Even though they're not supposed to use violence to police the camp, NAH members sometimes do. Earlier this week, an NAH member streamed a video on Facebook as they tried to remove a resident of the camp they believed was an undercover cop. His tent was spray-painted with the words "pig" and "snitch." The man said he was not a cop and outreach workers spent several hours trying to find him a bed in a shelter. 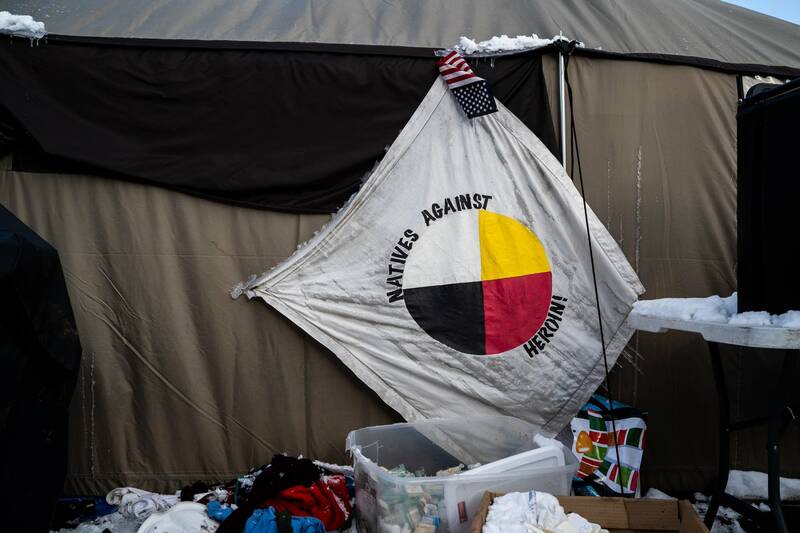 Staff from the Minnesota Indian Women's Resource Center and other native-led nonprofits say that recently NAH members have turned against them, accusing them of stealing donations and verbally attacking them. Stephanie Stuart said Jones threatened her and told her she's not welcome at the encampment. "He cornered me on the sidewalk and proceeded to start yelling at me," Stuart said. "Telling me that I wasn't welcome. That I needed to watch my back. And that they would know every single move that I make." Jones denied telling anyone to watch their back. NAH leaders won't have a role at the navigation center going up on Red Lake Nation-owned land. The Red Lake Nation and city of Minneapolis plan to contract with a professional security firm. Cross says NAH will work with the people who choose not to go to the navigation center. "Everybody is looking at the ones that want to go in there. We'll be the boots on the ground for the people who ain't," Cross said. Camille Gage is another outreach worker who says she's been verbally assaulted by members of NAH while trying to provide services in the encampment. She said she won't go into the encampment alone anymore. "I believe that in many ways they are honorable people. Everybody is working in an incredibly stressful and difficult situation," Gage said. "However, if you have one or two members not dealing with that stress well and acting out in really inappropriate and intimidating ways, leadership needs to step up and do something about it."